Almaty’s new BRT system will be the first of its kind in the region, bringing sustainable transport to thousands of residents. Photo by FixerKZ/Wikipedia. Since its introduction over 40 years ago, Bus Rapid Transit (BRT) systems have been adopted in over 190 cities. Across the world, BRTs have brought a level of reliability, efficiency, and safety to bus networks at a fraction of the cost and complexity of rail systems—making it a safe and effective solution for sustainable mobility in cities. Research has shown that cities that prioritize sustainable and public transport have significantly safer streets. A well-designed BRT system can reduce fatalities on the corridor by as much as 50 percent. While BRTs and bus-priority systems have been growing in popularity worldwide, no such systems currently operate in the Commonwealth of Independent States (CIS), despite the region’s significant traffic safety challenges. The CIS countries—former Soviet states like Armenia, Ukraine, and Tajikistan—have an average traffic fatality rate of 21.8 deaths per 100,000 people. This is almost 4 times higher than the rate in neighboring European countries. 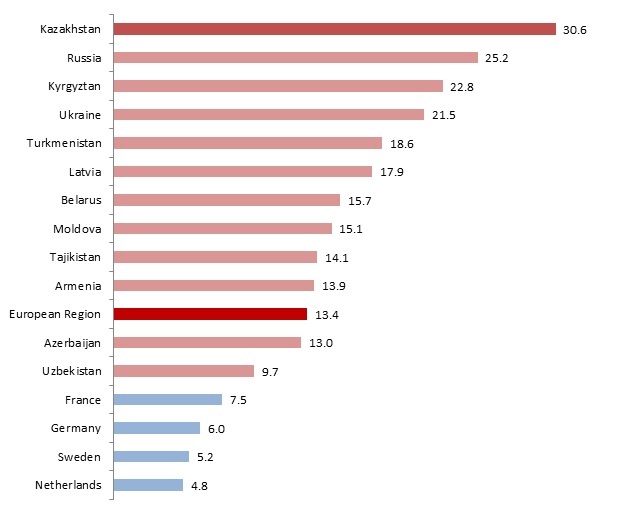 Among these countries, Kazakhstan has the highest number of road-related deaths and injuries. According to the officially reported data, 20,378 road accidents occurred in the country in 2014, and 28,527 people were injured or killed. City leaders in Kazakhstan are now taking steps to implement sustainable mobility solutions and reverse this trend. Since 2012, the United Nations Development Program (UNDP) and Global Environment Facility (GEF) have been working with the city of Almaty to develop and implement a new Sustainable Transport Strategy, with the development of a BRT system and improvements to the public transport network as key components. In Almaty, buses are the main mode of public transport. Almaty already faces considerable peak hour traffic congestion and pollution problems in addition to its high traffic fatality rate. Sustainable transport solutions can address these issues, which is why improvements to the existing transport network as well as a BRT system are necessary. The city’s transport strategy also calls for the expansion of its subway system and light rail transit (LRT) line. Currently, a single subway line—launched in 2012—serves the city, running 10 km over 9 stations and serving 36,000 – 38,000 passengers per day. Kazakhstan faces the highest rate of traffic fatalities in the region. Graphic from European Status Report on Road Safety, 2009. All these conditions mean that introduction of a well-planned BRT system will bring material benefits to the city in terms of passenger time savings and lower operational expenses. BRT will also bring additional benefits in the form of improved streets, traffic safety, better environmental conditions and reduced greenhouse gas emissions. The five planned BRT corridors are now a part of City of Almaty Sustainable Transport Strategy for 2013-2023. Feasibility studies and design of a 20km pilot corridor started in 2013, and these works are expected to be finalized by the end of this year. A critical factor for the BRT project’s success is the availability of experienced transport planning specialists, transport economists and traffic safety specialists in Kazakhstan. The lack of appropriate training courses in local universities means there is a dearth of specialized and experienced personnel. 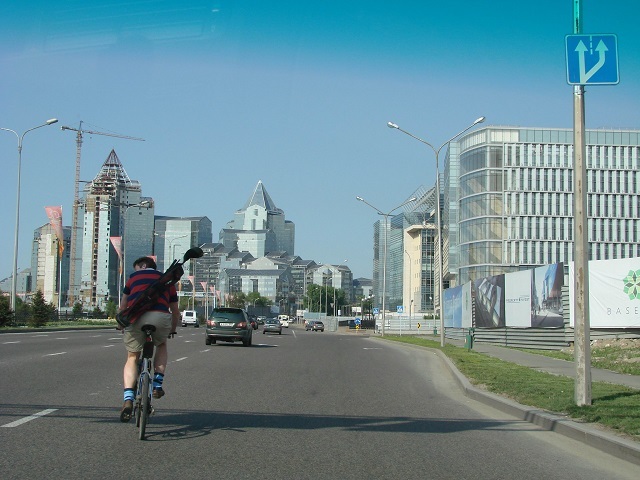 Another common problem in the region is outdated construction standards, many of which were developed before the collapse of the Soviet Union and do not meet requirements for safe, modern city streets. Sharing expertise across countries has often been beneficial for cities that have not previously implemented BRT systems. For Almaty, through the UNDP-GRF project, local road engineers, traffic and public transport specialists have had an opportunity to get acquainted with existing bus rapid transit systems in China, the Netherlands and Colombia, and to discuss design and planning with international experts during trainings and workshops with international consultants. Safe, sustainable transport and urban design in Almaty can bring about huge improvements in the quality of everyday life. By being the first city in the CIS countries with a BRT network, Almaty stands to be a leader and great example for Kazakhstan and the region. As part of the City of Almaty Sustainable Transport Strategy project, WRI’s research “Traffic Safety on Bus-Priority Corridors” has been translated into Russian to assist engineers and planners in this part of the world in creating safer cities. Click here to learn more.